Teddy Sseezi Cheeye, 51, took $56,000 (£38,000) from the Global Fund charity, which aims to prevent HIV, tuberculosis and malaria. He set up an NGO, the Uganda Centre for Accountability, which received cash in 2005 to do HIV/Aids community work. But the High Court in Kampala heard Cheeye siphoned off the funds instead. The ex-director of economic monitoring at the Internal Security Organisation, was sentenced on Wednesday to 10 years on one count of embezzlement and three years each for the eight counts of forgery, all convictions to run concurrently. Rejecting a plea for leniency from Cheeye's lawyer, Justice John Bosco Katutsi said: "In siphoning funds meant to alleviate and ease the suffering of the wretched of the earth... into his own stomach he is no better than a mass murderer," reported Uganda's New Vision newspaper. "Think of hundreds of thousands of the victims of HIV/Aids, TB and malaria who include innocent children from whom he robbed the little opportunity to receive a bit of comfort, nay a new lease to life, and you will know what beast he is. The time for reckoning is now." The judge said the state had proved Cheeye was the only director and signatory of his NGO, which had received funding to supervise Global Fund activities in the Ntungamo, Rakai, Kabale and Mbarara districts of Uganda. Relatives of Cheeye, who said he would pay back most of the stolen money, wept as the sentence was read out. Arrested last October, he is the second person convicted over the Global Fund fraud. The high court last week jailed a former Uganda Television producer for five years. An ex-Ugandan health minister, Jim Muhwezi, is being investigated over embezzlement allegations linked to alleged mismanagement of Global Fund monies. He denies any wrongdoing. 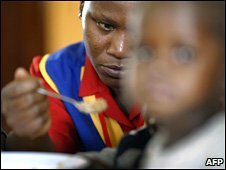 The scandal led the Global Fund to suspend its grants in Uganda in 2005.